Sinclair, the character you are about to meet is a seemingly normal bloke who does some interesting stuff; you could bump into him in your local wine bar or favourite restaurant. You perhaps wouldn’t take a second glance, unless, he was carrying his poppy-red umbrella, of course. If you were to meet Sinclair in your place of work, maybe a dark alleyway, or on your doorstep; you wouldn’t want to take your eyes off him. Sinclair has to travel and do some pretty exciting stuff, this is all connected to his job. The story isn’t particularly about what Sinclair does for a living, it’s more about how he lives and the people he comes into contact with. A lot of Sinclair’s characteristics and peculiarity, in his earlier days, had been sighted as eccentric. A mid-life diagnosis of Asperger’s had compounded a lot of insecurities for him. The bisexual element of his life he’d just taken on the chin. Sinclair takes stock of what he thought was his safety net of friends, colleagues, family and acquaintances. They perhaps were not all that they first made themselves out to be. Toby Krats is based in a small Lincolnshire Market-Town in the UK. STORY COLLECTION, BY TOBY KRATS. 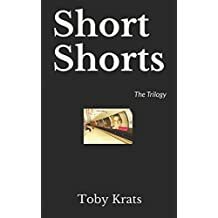 This trilogy collection of, mostly, non-interrelated short stories and ‘poem-style’ works by the writer Toby Krats is rich and lively. A dazzling array of personalities including a superhero, a slob, a Fairy-Godmother, a worker at McDonald’s, a teenage future, a race-car driver and a writer who all hail from different corners of the world, cross borders; both literally and metaphorically as they move from scene to episode. In “Sliced Bread,” for example, the superhero has nowhere to change, Daisy Duke has hopes of reconciling with her lost love. In another story, a slob crosses the line in order to seek revenge. There are ringing truths behind it all. The stories are amusing, yet sometimes the reader may feel a twist in their belly while laughing. Probably just wind. “Short Shorts, The Trilogy” is a rarity. Rather than write for a set genre, Toby Krats writes as the genres, adding depth and clarity to his descriptions. These are stories to be read again and again; each varying in length with the commuter in mind. Most hand-held devices will show and play, “Short Shorts”, batteries not included.